UPDATE (11/25/12): Tyma'z is now closed. Some time ago I had the opportunity to check out Tyma'z in West View. 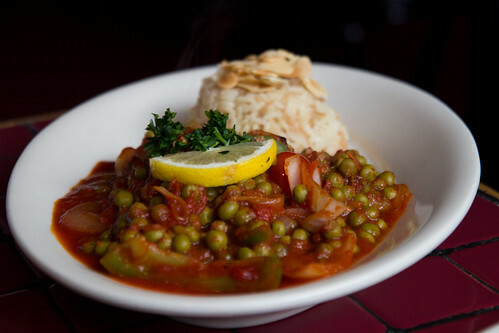 Tyma'z is a small, unassuming Middle Eastern eatery that sits along a stretch of Rochester Road where you wouldn't necessarily expect to find a restaurant. Honestly, I didn't even know it existed until my dining companion suggested it, and I might have completely driven past it on my way there had my GPS not confidently directed me to its whereabouts. Tyma'z is your casual, no-frills neighborhood spot. The decor is simple, maybe even a bit dated, but inviting. 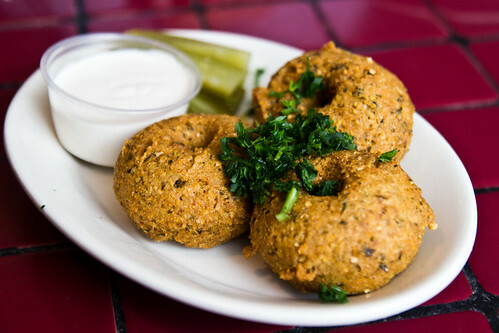 Tyma'z doesn't try to pretend to be anything other than a solid place to grab a bite of fresh, homemade Middle Eastern food. 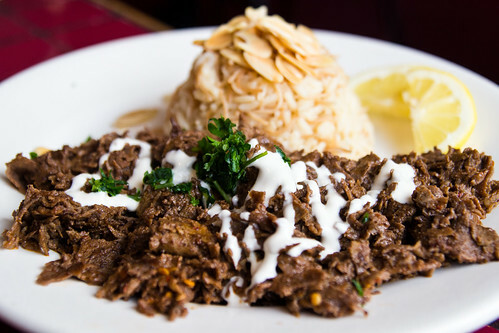 My Beef Shawarma was tender and perfectly spiced; it is a "house favorite" for a good reason. 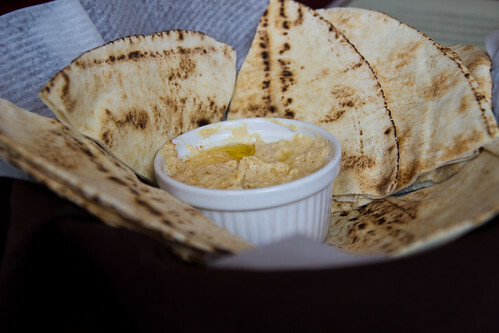 I also enjoyed the complimentary hummus, the Falafel appetizer, and a bite of my friend's Vegetarian Bazila. The service was friendly as well. 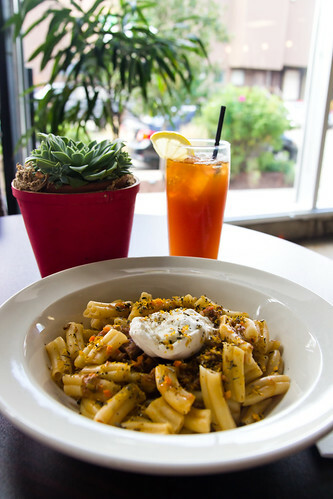 It's hard not to draw some immediate comparisons between Tyma'z and the nearby Mediterrano, though there are some important differences between the two. 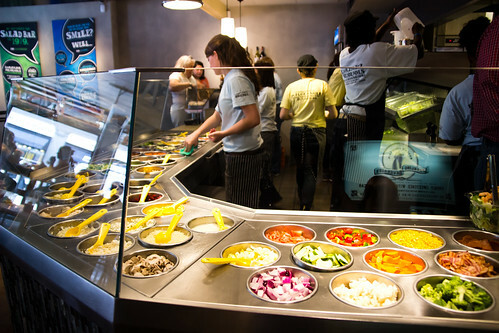 Mediterrano has a stronger focus on Greek cuisine, while the chef-owner of Tyma'z is from Syria which is reflected in the menu options. In addition, the atmosphere is completely different; Mediterrano is the more upscale and Tyma'z the more down-to-earth between the two. This is also reflected in the price points of the two restaurants. In sum, I had a good first impression of Tyma'z and I think it is a good option for Middle Eastern food in the North Hills. The Strip District has been undergoing some exciting new developments lately, and if you're in the neighborhood for some food shopping - because what else would you be doing in the Strip?? 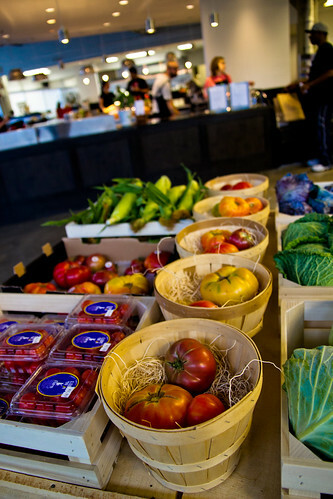 - you will find a new wonderful option in Marty's Market. Since the departure of Right By Nature last year, the corner of 23rd and Smallman Streets had remained vacant for months, which gave this part of the Strip District a somewhat desolate feel, in my opinion. 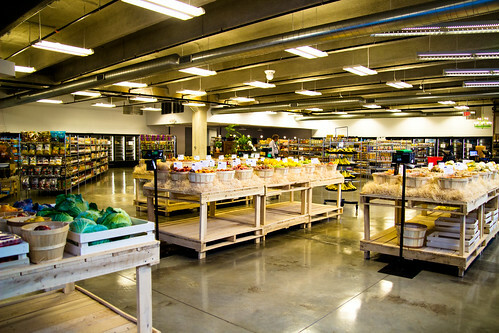 But when Marty's Market, named after owner Regina Koetters' father, took over the space, it has brought along a sense of renewal and vibrancy. 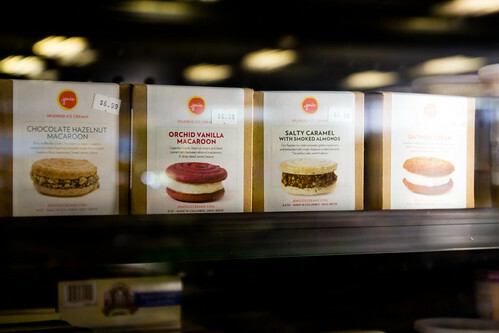 With an open design and transparent garage doors that give the shop plenty of natural lighting and a bright and welcoming atmosphere, Marty's Market is dedicated to providing natural, regionally-sourced, ethical, and organic foods to our community. 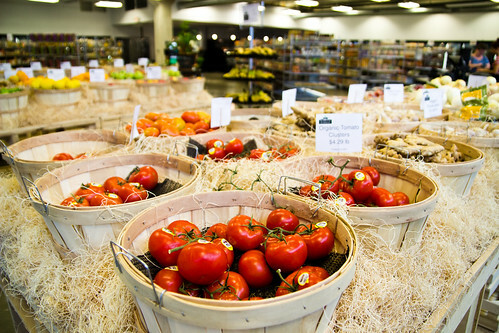 But Marty's Market is so much more than just a grocery store. 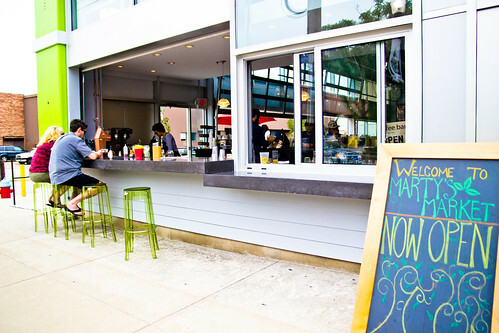 The front of the shop houses a coffee bar with a sidewalk counter. Inside, you'll find a cafe serving panini, soups, appetizers, and hot dishes, all prepared in the open kitchen in the back, with cafe seating both inside and out. 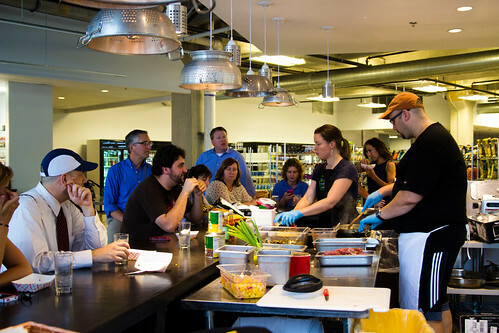 Sitting prominently between the cafe and the groceries is a modern food theater where cooking demos, classes, and other events are held. 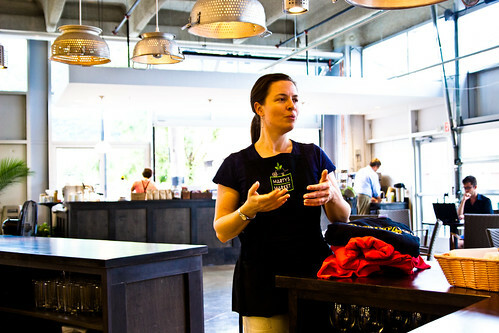 Indeed, Marty's Market is not just a grocery store, but a community-oriented space where you'll want to hang out. 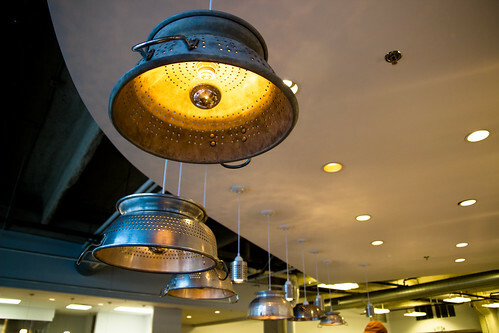 In addition, Marty's Market is so dedicated to the local community that not only is the food sourced locally as much as possible through connections with nearby farms, but even the decor reflects the restaurants and artists of Pittsburgh, like the light fixtures made with colanders donated by local eateries and the pasty domes featuring handles made by local artists. Every single detail has been thoughtfully put together. 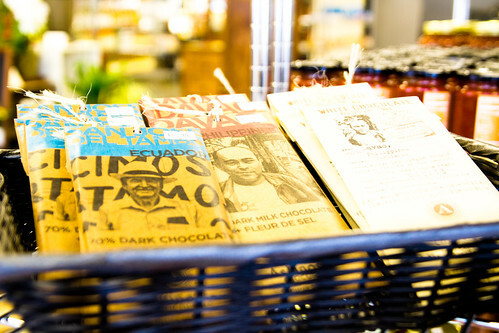 As if the herbicide-, pesticide-free produce and the shop's own butcher counter featuring antibiotic-, hormone-free meat aren't awesome enough, I was especially impressed by the fact that Marty's Market is the only store I'm aware of in Pittsburgh that stocks two very amazing products: Askinosie chocolate, recently named amongst the best chocolate in America by Bon Appetit Magazine, and ice cream sandwiches from Jeni's Ice Creams (in addition to Jeni's ice cream pints, of course - also considered among the best in the country). Regina Koetters is a woman after my own heart, as Marty's Market is pretty much the kind of market I would open if I were to be in the business. I've also had a chance to try out something from Chef Alan's cafe menu: Fresh fiori pasta with perfectly tender and juicy beef short rib ragout, topped with delicious fresh Burrata cheese and gremolata to round out the dish. 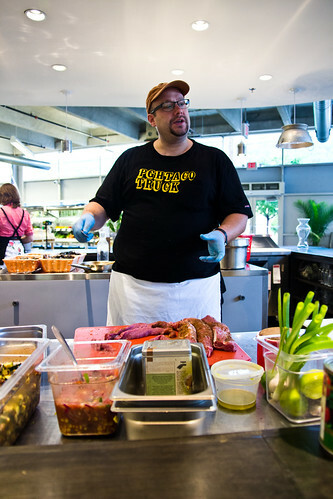 I mentioned earlier about the food theater at Marty's Market. 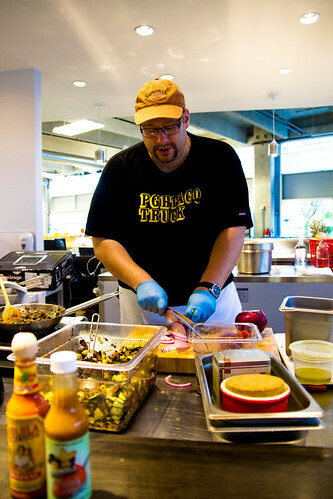 Several weeks ago, my friend James whose Pgh Taco Truck will be opening shortly hosted the inaugural demo and tasting event at Marty's Market. Here are some photos of the demo in action. 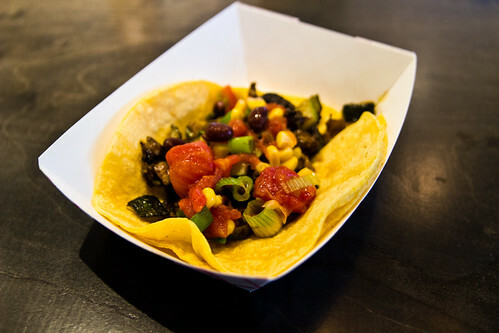 As always, the tacos were fabulous. 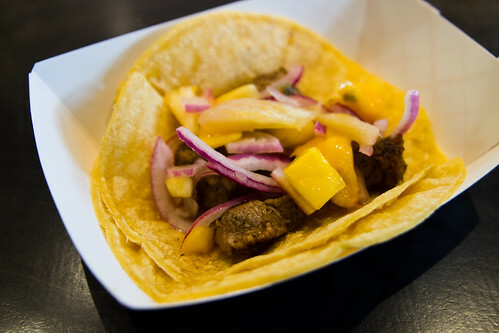 Attending the demo has really given me the opportunity to understand and appreciate the amount of thought and detail that has gone into every seasoning, every cube of meat, and every bite of veggie that make these tacos great. 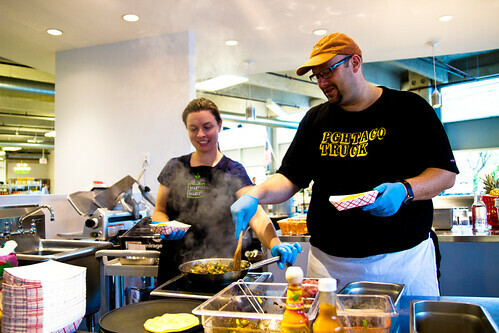 You can read more about the Pgh Taco Truck in my earlier post here. Several weeks ago R. and I took some time out of our busy schedules for a date night at Marisqueira Bistro in Aspinwall. Since we both liked Ibiza and I also enjoyed Mallorca (R. hasn't been), we figured Marisqueira would be quite good, as it is co-owned by Claudio Pereira, whose father owns the two side-by-side restaurants in South Side, and Francisco Buxareo. 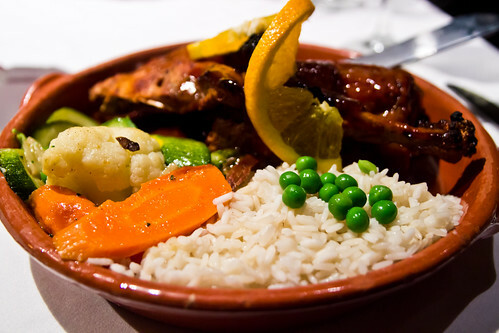 Located on the cute Commercial Avenue in Aspinwall, Marisqueira is beautiful and inviting inside. 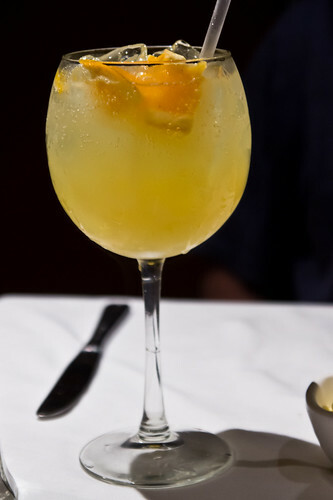 We started out with some tasty Sangrias, mine with red wine and his with champagne, and though both were great, we both liked the champagne one a little better. 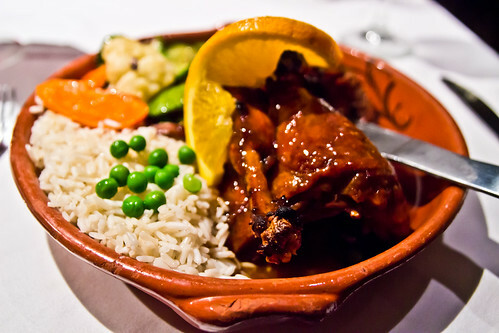 My entree choice was the Pato a Colonias, or roasted duck in a sweet mango sauce, accompanied by a fresh side salad. The skin on the duck was crispy and the meat tender. The sauce was sweet in a way that enhanced the flavor of the duck. A highly enjoyable dish. R. had a chicken dish that he loved as well. 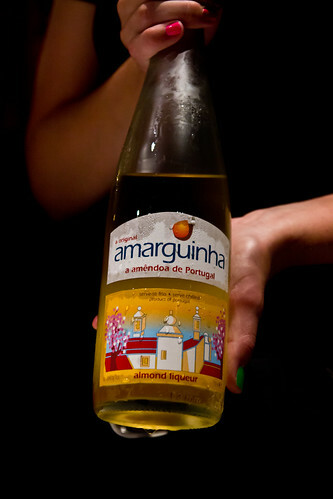 Towards the end of the meal, we were treated to some complimentary Amarguinha, a Portuguese almond liquor. The high quality of the food and the friendly service at Marisqueira are reminiscent of its sisters, Mallorca and Ibiza, but Marisqueira also has its own distinct style, flavor, and feel that makes it stand out on its own. It was, all in all, a lovely meal. 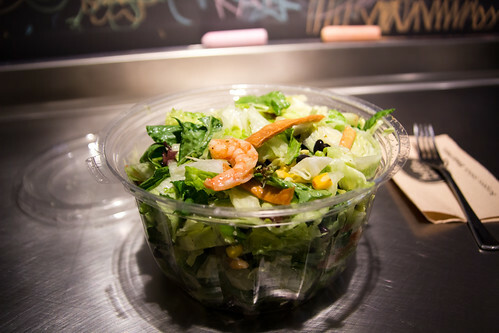 Instead of coming up with my own salad concoction, I went with one of Hello Bistro's creations - the Caribbean Shrimp Salad, which consists of mixed greens, marinated shrimp, avocado, black beans, corn, tortilla strips, and citrus lime vinaigrette. 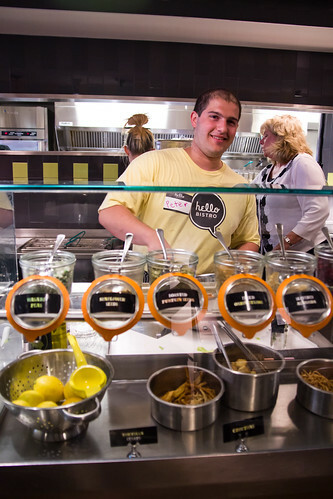 Once you place your order, a staff walks down the display of salad toppings filling a bowl with the appropriate ingredients. Then your bowl is handed off to another staff member. In my case, it was a friendly young man named Peter who posed in a photo for me. He chopped my salad whichever way I wanted (medium chunks, please) and added the amount of dressing I wanted (moderate, please). And voila! My salad! 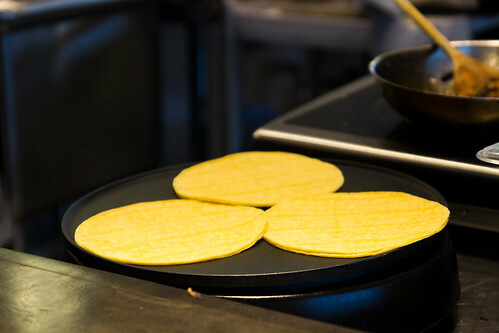 Fresh, tasty, and great combination of ingredients and flavors. Way better than what I can make at home, and the portion is huge, too. 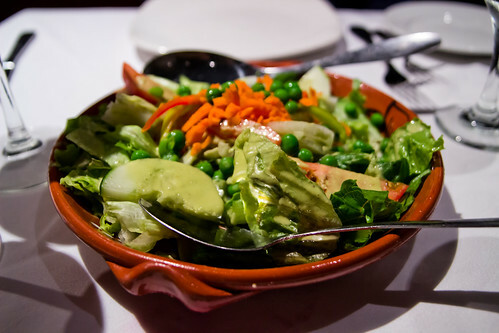 I filled up on just this salad alone. 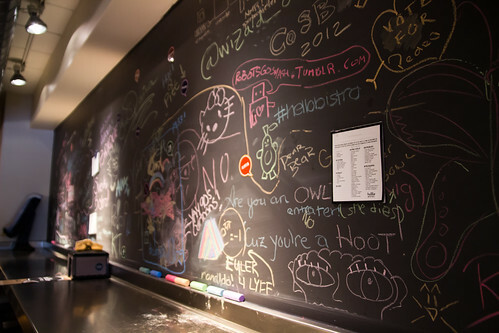 The setting at Hello Bistro is contemporary, casual, and a bit quirky. I sat at the bar in front of this gigantic blackboard...as though all the students coming in would really want to see another blackboard. But I must admit, it does add a certain playfulness the space. 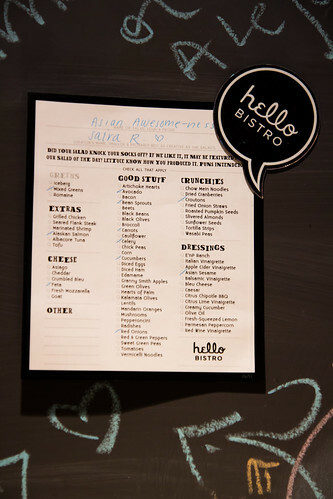 And speaking of students, expect to run into drones of them as Hello Bistro is located on Forbes Avenue in the heart of "college central" (and just a couple doors down from my favorite Razzy Fresh - BONUS!). It was pretty busy even in the summer, so it'll be interesting to see what the lines are like when school is back in session. As a salad lover, I will be back for sure. Will I ever try a sandwich or a burger at Hello Bistro? Maybe. But the big draw for me is definitely the delicious and fully customizable salads that I am unable to replicate at home. 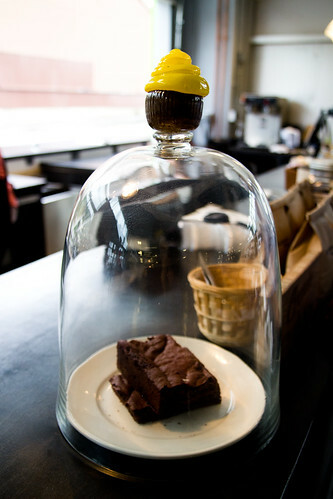 I might even create my own salad next time at Hello Bistro.